November 3, 20111 - Legendary pilot and aviation executive returns home to celebrate lifelong contributions to aviation. From the time he was a young boy growing up in the farmland of Wichita, Kansas during the Great Depression, veteran pilot and business aviation pioneer Clay Lacy experienced a natural fascination with flight. He first took to the air at age eight and began working at a local airport in exchange for flying time at age 12. He has since spent nearly every day of his life around airplanes. Next Saturday, November 5, Lacy will return to his hometown to attend this year?s Kansas Aviation Museum Gala, where he will be inducted into the Kansas Aviation Hall of Fame for his extraordinary achievements in aviation. The ceremony comes on the wings of Lacy receiving the National Business Aviation Association?s Meritorious Service to Aviation Award business aviation?s most distinguished honor for his lifelong dedication to building the industry from the ground up. He is also an inductee to the National Aviation Hall of Fame and the recipient of numerous other prestigious awards. Lacy is a world-renowned pilot whose lifetime in aviation has included experience as an Air Force and airline pilot, fame as a national air racer, and international success as a director and videographer specializing in air-to-air sequences for Hollywood blockbuster movies and television commercials. In October 1964, Lacy introduced the first business jet to Van Nuys Airport (VNY), and from 1964 to 1967, he worked as manager of Learjet sales in 11 western states. In 1968, he established the first jet charter service west of the Mississippi River, at Van Nuys Airport near Los Angeles. Today, he is still owner and chief executive officer of Clay Lacy Aviation, a full-service aircraft charter and management company known as the most experienced operator of private jets in the world. Clay Lacy Honored by Kansas Aviation Hall of Fame With his unparalleled record of flying time, Lacy has touched upon more aspects of aviation than any other pilot. He has flown more than 300 aircraft types, established twenty-nine world speed records and logged more than 50,000 flight hours. Known as the ?pilot?s pilot,? he has accumulated more hours flying jet aircraft than anyone on Earth. Kansas aviators Clay Lacy and Ken Collins, a famed SR-71 test pilot, will be inducted into the Kansas Aviation Hall of Fame during this year?s Kansas Aviation Museum Gala to be held on Saturday, Nov. 5 at 6 p.m. at the Hyatt Hotel Grand Ballroom in downtown Wichita. Aviators Micky Axton and Tex Johnston will be inducted posthumously. 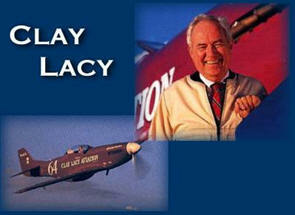 Clay Lacy Aviation was founded in 1968 by Clay Lacy, CLA operates one of the largest fleets of charter and managed aircraft in the world. The company?s fixed base operator facilities at Van Nuys Airport in Los Angeles and Boeing Field in Seattle offer aircraft charter, management, sales, maintenance, avionics, and aircraft interior and completion services. CLA offers additional jet charter and management services in Denver, Colo.; Orange County and West Palm Beach, Fla.; Hartford, Conn.; and San Diego and Santa Barbara, Calif.